The family house on the corner of Green's Lane rang with laughter and excitement as two people, a former deputy police chief and a former school teacher whose love for each other had survived close to seven decades took me back in time. The late afternoon heat and noisy out-door traffic just beyond the living room windows were at that moment forgotten, as I sat crossed legs, eyes fixed on a small energetic retired teacher and decorated cop, as they took me back to a small farming village in the eastern village of Laplaine. It was the year 1943, the Sunday after Easter called Quasimodo Sunday when the parish priest, along with the young ladies from the Catholic Action Movement, which she, Clothilda Laudat ( now Doctrove) was a part of ; went down to La Roche to conduct service. Now the young handsome officer named Hildreth Lorden Doctrove nicknamed 'Chung', was stationed at the Police Station, when the first eye contact was made. "So that Sunday after mass, when we came out, I saw him and another police with him, 'so we saw in the yard, we didn't speak, but we saw each other. Total strangers', she said. "A couple months after that he was transferred to Laplaine," Mrs. Doctrove explained. "So at month-end now, we the teachers had to go to the magistrate when he comes up from Grand Bay, he used to bring our salary so we used to go after school to the magistrate where he lived to collect it," she recalled. "So we used to meet him on the way, either he come from river bath, or whatever it is, but he didn't bother much with us he bothered with the head teacher, he used to speak to the head teacher, as if we were lesser mortals," she said. Mrs. Doctrove also remembered seeing him from time to time, during her out-door classes she recalled seeing him passing up and down going about his duties, " but we haven't spoken at all you know," she said jokingly. "So one day now, he was going at a neighbour, for something or the other, he had to pass in our yard to go to the neighbour's house. So in passing, he saw my elderly aunt in the yard, who was from Roseau and who got ill so my mother took her to live with us. So him being from Roseau he knew her so when he saw her in the yard he came in to the yard to say hello. "Then I saw him and that is when we spoke for the first time," she stated, and one thing led to another and she distinctly recalls him telling her that when he came into the yard he saw her hat hanging on the hat rack and he said 'that's where that girl lives'. She then concluded that she was not the only one looking at him. Mrs. Doctrove said when things were starting to get serious between them he wrote her a letter, which she brought to her parish priest; much to his embarrassment and much laughter, by us three. She was told to watch and see what kind of person he was and she got some good advice. When Mr. Doctrove was brought to the Laudat family for approval, he received high marks, and they began dating and decided that they wanted to spend the rest of their lives with each other. They got married on Monday 26th November, 1945, on a warm, quiet sunny day; she was 21 years and he was 25. The wedding was a family affair held in her family yard. She didn't wear white but instead wore a dashing light-blue dress and matching cap. A few years into their marriage, they had their first son named Chaucer, in Laplaine, before her husband was transferred to Vieille Case where they spent 3 ½ years and had their second son, Fitzroy. Her husband was transferred again to Marigot where they spent eight years and where their third and last son, Billy, was born. Mr. Doctrove began his law enforcement career in 1941, and retired early as deputy police chief. Mrs. Doctrove started teaching in 1940 and retired after almost 40 years. She was born on 3rd June 1924 and is now 89 years old. Hildreth Lorden Doctrove was born in Newtown on 20th February 1920; he now 93 years old. 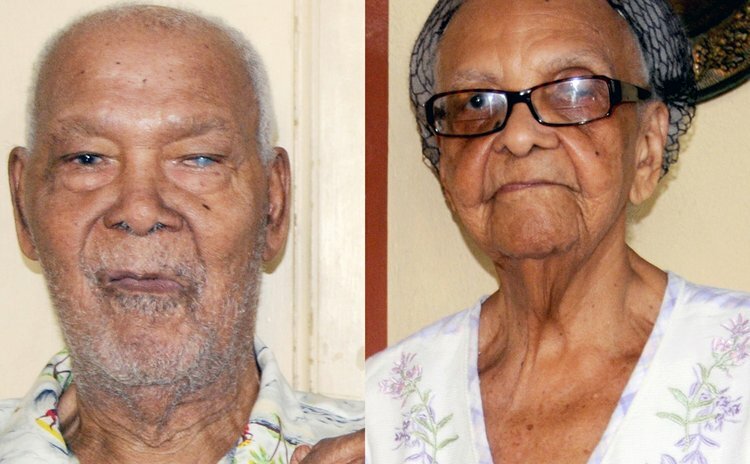 They have been married for 68 years and they both said they would gladly return to that blessed Quasimodo Sunday when they first met and do it all over again. They spent their 68th anniversary with family and friends and had a small service in their family room.